on the beautiful Carnival Inspiration departing Friday, February 10th. ​How much fun can you have aboard the CARNIVAL INSPIRATION? More than you can imagine, including: a 9-hole mini golf course, Carnival WaterWorks water park, a tropical resort-style pool and Serenity-Adult only Retreat. And, that's on top of the delicious dining options, onboard activities, nightlife, casino games and relaxing spa treatments that have been part of CARNIVAL INSPIRATION all along. The pricing below is based on double occupancy. Pricing is per person and does include the taxes and port fees. The 3rd and 4th passenger in each cabin will be at a reduced rate. The deposit would be $100 per person due to secure your cabin. Rates are subject to change and your balance due by December 12, 2016. 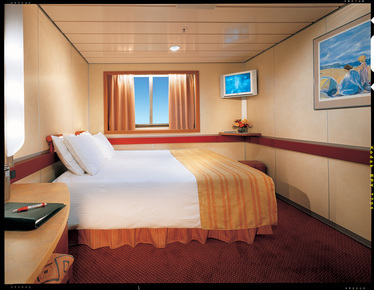 Single occupancy cabins will pay a single supplement equal to almost the same price as the double occupancy cabins. • Vacation Protection premiums are non-refundable / non-transferable. 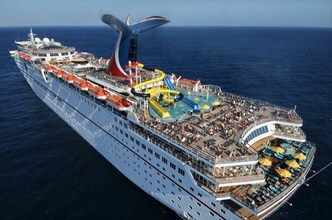 • Carnival strongly recommends the purchase of the vacation protection plan. Please remit the additional amount of $49.00 USD per person with your deposit if you opt in for insurance. 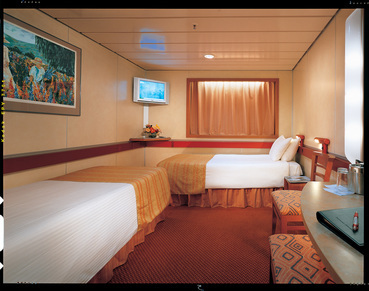 • All staterooms, inclusive of the balconies, are an entirely smoke-free environment. Smoking is prohibited in all guest staterooms and balconies. Guests who smoke in these areas will be assessed a $250 USD cleaning and refreshing fee on their Sail & Sign account. • Service charges will be applied for changes made within 60 days of sailing. Oceanview Cabin - Two twin beds (or one king) - These cabins have a picture window that doesn't open. Cruise rates are in U.S. dollars, per person and based on double occupancy. Offer is non-transferable, and has no cash value. Category restrictions and exclusions apply. Rates are capacity controlled and subject to change without prior notice. Offer is not combinable with any other discount or promotional offer. or day may change. For the most current itineraries and terms and conditions related to your cruise, please contact your travel agent for details.